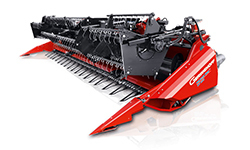 Geringhoff offers innovative and robust harvesting technology in order to maximize productivity. Geringhoff puts special emphasis on maximum reliability, optimum harvest yields and minimal maintenance. Modern drive technology for highest operating security. Drive without chains and belts for smooth and intensive use. Geringhoff is a manufacturer of modern harvesting machinery and stands for high quality, technically advanced and innovative products. Click on http://www.geringhoff.com/ to find out more about the company.